Hello, anybody reading. I have a rather large collection of photos which I am seeking to share in some form. I want to share it because birds make me feel loved in a very unusual way–a way that, as my mother puts it–is un-fraught. Perhaps you will start to notice the same thing. I hope so. This one is called “Bluebirds at Home”. 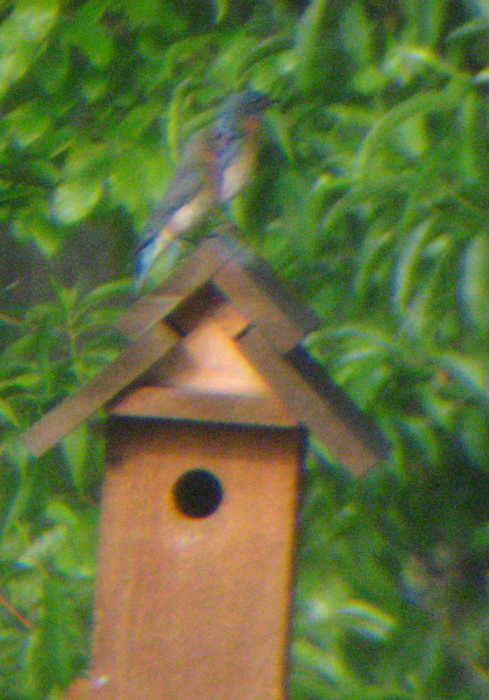 I have immensely enjoyed watching the bluebirds who have lived in the closest bluebird house during past years. This photo is one that is a product of a strange new habit I picked up. My Canon A-550 does not have the best zoom. I tried taking photos with the lens against the binocular eyepiece. The trouble is, it only works on sunny days. Even then, my hand began to tremble, producing a blur. The picture of the blue birds looks like something out of a fairy tale! Very mystical and beautiful to look at.